Pictured from left to right: Colleen M. Hanycz, Ph.D., President, La Salle University, Michael B. Laign and Sister Anne Marie Haas, CSR, Holy Redeemer Health System, Gregory J. Webster, ’81, Chief Operating Officer, PMC Property Group, and Stephen T. Zarrilli, ’83, Chair of the Board of Trustees. On Saturday, February 23, La Salle University held its 27th Annual Charter Dinner at Normandy Farm Hotel and Conference Center in Blue Bell, PA. The Lasallian Leadership Award, an award which recognizes an individual who displays outstanding leadership in corporate, civic, governmental, or religious communities, was presented to Gregory J. Webster, ’81, Chief Operating Officer of PMC Property Group, which develops and invests in apartment, office, and industrial buildings, as well as hotels. Webster has served on the boards of the Boys and Girls Clubs, Junior Achievement, and the National Association of Office and Industrial Properties. True to his roots, Webster remains an active alumnus of La Salle University. He served on the Board of Trustees from 2008 until 2018, and he has continuously offered his time, talent, and treasure to many areas throughout the university, most notably the School of Business and the Men’s Basketball program. In 2016, Webster was inducted into the De La Salle Society which recognizes the University’s most generous donors. The Lasallian Impact Award, an award which honors an organization whose core values, culture, and service strongly align with La Salle University’s mission, was presented to Holy Redeemer Health System. Michael B. Laign and Sister Anne Marie Haas, CSR accepted the award on behalf of Holy Redeemer. With an emphasis on providing a continuum of care, Holy Redeemer Health System remains true to the mission that the Sisters of the Holy Redeemer began in our region in 1924 – to provide high quality, compassionate care. Today, Holy Redeemer offers a wide range of healthcare and health-related services, including an acute hospital care, home health and hospice services, skilled nursing facilities, personal care, a retirement community, low-income housing, an active living community, and a transitional housing program for homeless women and children. The Charter Dinner celebrates La Salle’s founding on March 20, 1863, and pays tribute to the generations of Christian Brothers, laypeople, and clergy whose dedication have made La Salle University the prominent institution that it is today. Over the past 25 years, the La Salle University Charter Dinner has raised more than $4.5 million, and proceeds have been used to enhance the University’s Scholarship Fund, benefiting many La Salle students. Hansen Properties, Inc. and Bud Hansen, III, ’90 served as the Host Sponsor of this year’s event. The Presenting Sponsor was PMC Property Group, and Berkadia Commercial Mortgage LLC and Stradley Ronon Stevens & Young LLP were both Platinum Sponsors. 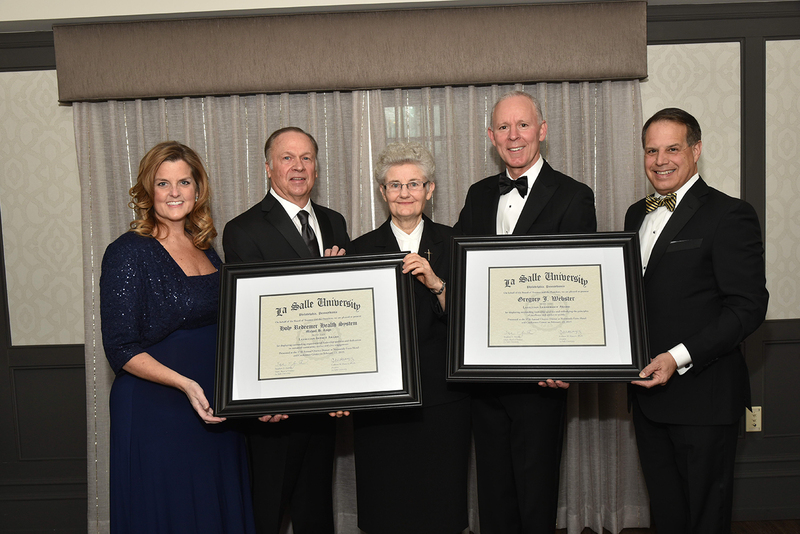 The post La Salle University’s 27th Annual Charter Dinner Honors Gregory J. Webster, ’81, and Holy Redeemer Hospital appeared first on La Salle University.